We love homemade waffles in this house, but my “Go to” Malted Belgium Waffle recipe consists of a lot of butter. Trust me, my Belgium Waffle recipe is worth the extra time, but I have been experimenting with an easy and quick homemade waffle recipe that uses oil. 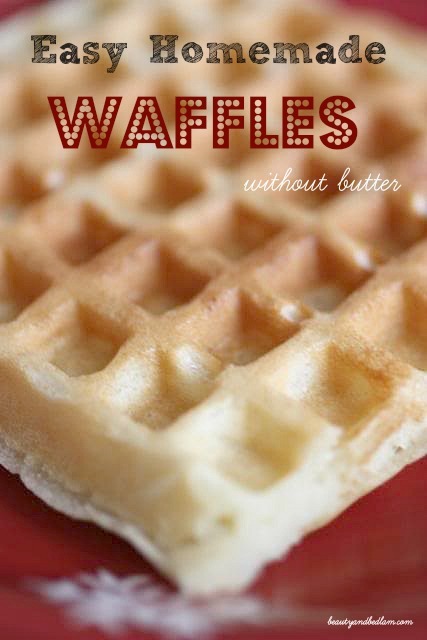 “Oh Boy” Waffles...Yes, easy homemade waffles without any butter! Using oil instead of butter really helps on the budget and by making extras and freezing them, breakfast is a breeze during the week. Bake in waffle iron. Makes 10-12. ***Update on the Pantry Challenge: Since I first made these during my Pantry Challenge where I could only eat from my pantry for one month , I had to be creative. I TRIPLED the batter, knowing that our family consumes large quantities of food and I was hoping for a few extra to freeze. I had a few bedlam moments along the way. I mixed all the dry ingredients, added the eggs, and then added 2 1/2 cups of milk because that was ALL I had. Yikes, and I had already tripled everything else. But guess what? When you are committed to creative cooking for one month, you just ad lib. Unfortunately, my fifteen year old waffle iron gave out and it would have been when I tripled the batter, so I used a sandwich griddle. Improvisation is key. I’m saving up my Swagbucks and “buying it for free” because we really “need” two waffle makers or at least one that makes four waffles. Otherwise, waffles take two hours in our home. I can’t wait to reach my goal using my swagbucks. Don’t you love Swagbucks? Those look yummy. We love waffles. Hey, Jen! I love waffles, so glad you got another waffle iron. I would love to have one, not sure my cabinets can hold another gadget. But, if I found one for $5, I might have to get it. Can’t wait to see you at Blissdom! This brings back such wonderful memories of my childhood. My mom made those “Oh Boy” waffles. I’ll have to try your recipe of them. Thanks for sharing, and for hosting this! That was a great ending. I am so happy you found a new waffle iron. It makes me want to drag mine out. It has been years. I am so cracking up at your grilled waffles!! What a great problem solver you are though! Thanks so much for hosting today – love your blog! We love waffles in our household. They take a long time, but my kids think they’re worth waiting for. Thanks for the recipe linkup today! Try a bit of orange peel grated into the batter. Very nice. We love making Oh Boy! waffles! We’ve been using that recipe for years. My husband and our daughters always make some together for Saturday morning breakfast. Too sweet! We have tweaked the recipe- we at least double the number of eggs and we used dried milk (mixed with water) instead of fresh (tastes the same and we get to keep our fresh milk!). I love topping my waffles with cooked berries and cream. Oh, yummy! Oh, and if we have leftover batter: I save it in the fridge and make Waffle Batter Pancakes for my girls on school days. They love it! Sounds Yummy! To cut down on the fat content of the waffles, we substitute Apple Sauce for about half of the oil that the recipe calls for. You really can’t tell the difference. They are so moist and taste great! We also add just a little almond extract to add to the flavor. Enjoy! Combine the flour, baking powder, confectioners sugar, oil, milk and egg yolks. Beat the egg whites until they stand in soft peaks and fold into the batter (do not overmix). Using a 4-ounce ladle, pour 1/8 of the mixture into a hot waffle iron and bake for about 2 minutes. Top with the fruit and whipped cream and serve hot. I use that same recipe, (well, the one you started with anyway) and I love them. They are simple, fast and make a bunch. I have eight children and I can get eight waffles (using a restaurant style waffle iron) out of one batch. Yum!! Now I’m hungry! Linking up today for the first time!!! So much fun! I’m thinking about tweaking it yet some more with whole wheat flour (maybe even add a little bran or other fiber) , non-fat half and half and trying to figure out a fat substitute that will allow the waffles to keep their texture…thanks for the inspiration! Guess I need to put a sticky note on my forehead, lol. I added you to my post and then never came back and linked up. What if you don’t have a waffle iron? will it still come out the same? You could try it like you might pancakes, but a waffle iron is preferred. I don’t usually leave a commentafter I try a recipe, but these waffles were to good to go without praise. The first time I made them just as you did (with a added 2 tbls. of flaxseed) and everyone loved them. The second time I used a cup of whole wheat flour and just 1 1/4 cup all purpose. They didn’t taste any different than they did before. The next time I make them I’m going to add some bluberries and see how they taste. Now I need to find a good homemade maple syrup recipe to go with it. @Shari, It’s supposed to be a thin batter, but they should bake up just fine. Did they not bake up well in the waffle iron? If you had all the correct measurements,then I am stumped because we use it all the time. So sorry. Don’t you love the creativity of the Pantry Challenge? These look delish! Thanks for the recipe. I’ve just tried this, and by the last half dozen I got the consistency right. Mum a nd really enjoyed them. The rest that were not eaten will save for tomorrow. I stumbled across your waffle recipe this morning. There’s no butter in the fridge and I wanted waffles for breakfast. I think I just found my “go to” recipe. It’s a definite keeper. The waffles were so light, fluffy and crispy. I had mine with a smear of orange marmalade. So yummalicious and easy to make. YAY! !So thrilled you enjoyed them and how fun that we are having the same recipe from different sides of the world. I love having a different recipe where I know I don’t need the butter. Have a great day. I just made these with a few alterations and I just want to say, this is going to be my go to recipe for waffles from now on. Thank you so much! I used homemade coconut milk instead of milk and coconut oil for the oil and I also left the sugar out and added some pure vanilla extract instead. They cooked so beautifully and tasted even better. Thanks again.